**APRIL-MAY DISCOUNT-Sunday through Thursday- $550 a night for up to 14 people-All weekends in April and May are sold out..do 2 weekdays and reap the discount! Thomas Wolfe wrote "you can't go home again." We at Norally respectfully disagree. Home is all your loved ones under one roof sharing memories and making new memories. Home is this large family mountain home that has all the modern amenities a family could want or need with out losing that warm feeling of Home..your home. We'll leave the light on for you, come home anytime. ***Our pictures are not professionally done or photo shopped. All of them have been taken by the owners and pass guest from cell cameras or regular cameras. What you see in our pictures, is what you will see for real not doctored up. Except for the Santa Claus picture..he wore makeup...haha. We feel there's nothing worse than a picture that is not even similar to what is real. Nothing could be finer than to be in Carolina anytime!! Come enjoy the Spring and Summer star filled sky's from the comfort of our beautiful surround deck. The 4th of July is always a favorite to sit in comfort on the deck and watch the fireworks from all around the mountains and valleys. Or hang by the campfire enjoying the night time views while the kids catch fireflies. Bring the whole family and friends there's plenty of room. This vacation rental accommodates up to 24 in beds with plenty of gathering areas through out the house and grounds. Our goal is to insure that our vacation rental be the best it can be and still remain affordable. The owners/managers of this family owned and operated vacation rental are always there after guest leave and just before they arrive. We help cleaning, inspecting and ensuring that everything is cleaned and all linens are replaced (including bed spreads) and supplies replenished in between every reservation. Our rates include cleaning charges along with all kitchen supplies, napkins, paper towels, dish soap, dish washer tabs, dish towels, garbage bags, gas for gas grill including back up tank, all bedroom linens, extra blankets, extra pillows, bath soap, toilet paper..etc. 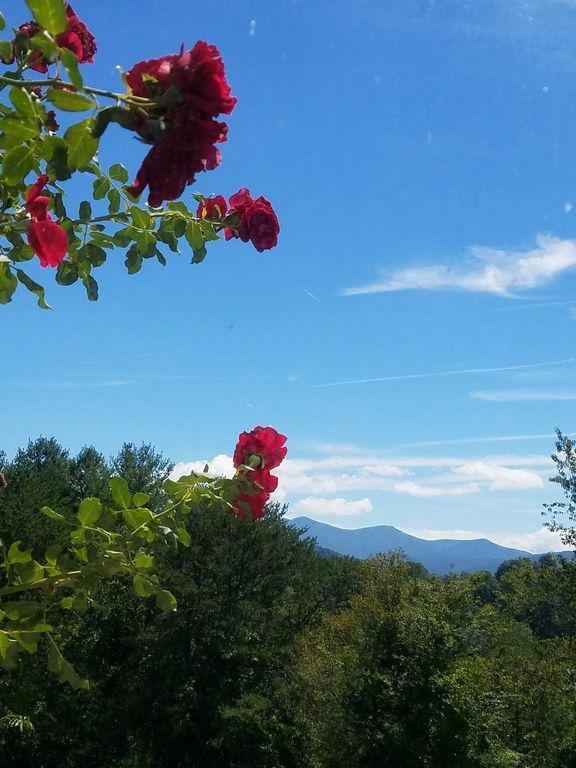 Come be at the heart of everything that happens in Asheville and the surrounding area while enjoying the privacy of two acres of surround mountain views! All bedrooms are private. Two bedrooms have a king bed and 5 bedrooms have a queen bed in each room along with tables, sofa, TV so couples can enjoy private time while still vacationing with the whole family and friends. No need to share a bedroom unless you want to. There are additional sleeping areas in the game room. Rates are all inclusive and include cleaning. Escape to what has been named the most magical destination on the planet, the magnificent Appalachian Mountains. The ideal location and spaciousness of this vacation rental makes it ideal for multi-generational family reunions/get together, groups of close friends, Corporate team building trips, sports teams, adrenaline hunters, groups of retirees, organizations or clubs, festival goers, bachelor/bachelorette parties. Our Asheville Area Vacation Rental is located 10 minutes from downtown Asheville, 10 minutes to Biltmore Estate, 5 minutes from Grove Park Inn, 20 minutes from the Asheville airport, just minutes away from every adventure you may want and sets on two private country acres of surround breathtaking mountain views. Norally House is decorated inside and out starting the first weekend in November so everyone can come and enjoy the Holiday season in this beautiful Mountain area with family and friends. Bring the whole family and friends, there's plenty of room at this vacation rental. Norally house can accommodate up to 26 and we have a neighboring property with in walking range that can accommodate up to 6 more. We know you will enjoy our lovely Asheville area family vacation rental, just read our reviews. From the moment you step into the door you will feel Welcome and at home. Memories of childhood calling you home--Home to NORALLY where you are always welcome always at home. Our home offers the, convenience and comfort you want in a vacation home, with all the comforts of home and more. You're sure to enjoy the surround beautiful mountain views from every window, deck and the grounds at this vacation rental. If you dream of beautiful Blue Mountains, star filled skies, waterfalls, bubbling rivers, bright fall colors, misty fall mornings, snowy winter days and fireside winter nights--wake up and live your dreams. Yesterday is still here in these mountains, the music the joy of living, the magic of discovery. Sit on rockers and watch the sun set or horses running in the mountain breeze. Watch smoky fog and haze rise above the valley and mountains. You'll be glad you came home to Norally House, where you are always welcome, always at home. All our beds have 600 to 1800 thread count sheets and all towels and wash cloths are fluff and soft. Bath bars, hand soap and (if you forget items) are kept in each bathroom. We do not charge extra for linens or supplies and we do not charge a cleaning fee. Our fees are all inclusive. The large kitchen is completely supplied with napkins, paper towels, dish soap, and whatever the cook or cooks may need, including china and stemware. The spacious wrap around deck has comfortable setting, dining tables and allows visitors to enjoy surround, mountain views while cooking on the grill or dining. There are views from every window. The dining room host two large tables, buffet server, china and seating for up to 24 guest. All the seven bedrooms have queen beds, one 46 in and six 32 in HDTV and wonderful views. There is additional sleeping in the game room. Extra pillows and blankets are supplied. All bathrooms are supplied with paper products, soap and plenty of towels and wash cloths. The game room has foosball, ping pong, TV and DVD. The Spa room has a large 7 person hot tub, refrigerator, TV and DVD. The Grand room has a 65 inch internet Apps Plus with build in Wi-Fi HD with surround sound , collection of DVDs and tapes for all ages to enjoy. We pride ourselves in also providing a wide verity of books and magazines for all age groups and seasons including new releases. The horseshoe pit is conveniently located near the outdoor fire pit. There is a basketball hoop, botchy ball and croquet set for guest and families to enjoy. We have a shopping service that will do your grocery shopping and have everything in the kitchen waiting for your arrival. They will also shop for any bathroom items you may also want although we do supply most bathroom items. Please inquire about this great service. Need Catering just ask, we supply a list of our guest favorite catering. We supply all paper products, kitchen cleaning supplies, bath soap, hand soap and if you "forgot" items in the bathrooms. There is a sewing kit in the laundry room. Brochures of area activities, adventures and points of interest are kept in the foyer. The Asheville area host many seasonal favorites: The Corn Maze, Bele Chere--in July-The largest street festival in the southeast--berry picking time in early Spring and Summer--Apple picking time in September. The Farmers Market in Spring thru Fall--Sliding rock, golf, historical sites, many festivals, hiking, biking, walking, fishing, river rafting, horseback riding, shopping, dining, outdoor plays, just to name some. There is no need to get bored with all this area has to offer. At this vacation rental you can play a game of horseshoes, botchy ball, ping pong, foosball, do a puzzle, soak in the hot tub, shoot some hoops, pick flowers, catch a butterfly, do some bird watching, read a good book from our Book Shelf's, sit by a camp fire, catch some fireflies or just set back and observe the Carolina star filled night sky, you may just see a shooting star. If it should rain one of the days you are at Norally House remember to look out over the wrap around deck for the rainbow that always appears across the mountains. There is a reason why guest keep coming back to Norally where they are always welcome, always at home. We offer Discount Biltmore Tickets which are good for two days and (less than a one day ticket) to guest who stay with us. **What time is check in and Check out? **How do we check in? We have electronic check in. Guest go directly to property and enter a door code that is assigned to them. **Do you allow earlier check in’s and later check outs? Yes, when ever possible at no additional charge, please inquire. **What kitchen cookware is in the kitchen? Everything we can image anyone needing is in the kitchen. **Do you supply linens and towels? Yes, we even keep river towels for guest to take to the river and we have extra blankets and pillows. My Husband and I designed and built this beloved property in 1987 for our growing family. We wanted a 6 bedroom home close and easy access to Asheville on some small acres with surround mountain views from sun up to sun set. We felt that if we were going to live in the mountains we wanted to see them from every window. We did not think we would find the perfect spot until one day we got lost actually heading to another piece of land for sale. We pulled over unto a road off the main road to check out a map because we did not have GPS back then. It was a beautiful summer day and while my husband was checking out the map I was looking around at the beautiful sight before me. I remember leaning against our car and saying “why can’t we find a perfect spot like this.” My husband looked up and said “wow!! Guess you got to have a bit of luck or angel to find perfect spots like this.” We both started to walk around the beautiful location pointing out how perfect it was. As we walked back to the car a man walking his dog came over to us and told us he lived just down the road. We introduced ourselves and told him we were lost he started to help us by giving us directions to where we were headed. We mentioned that we hoped the property we were about to see was as beautiful as the one we were standing in front of. He then said “well you know this property is for sale the sign must have fallen down.” We could not believe it!! He had the name and number of the owner. We got in our car decided the heck with even looking at another property. We had found what we wanted. We headed straight back to our rental called the owners of the two perfect acres and closed the perfect deal that night. The rest is History. I do not believe in luck but I do believe in Angels. The surround mountain views made us fall in love with this property. The private two acres just 10 minutes from the heart of Asheville is an added plus. The French Broad river is one and half mile bike ride or jog. The small town of Weaverville just a stroll away. The fine dining in Asheville and Weaverville is outstanding. The many festivals and events held all year around is always exciting and fun. A grand adventure seems to be waiting around the bend all year round. Visitors can enjoy viewing wild turkeys, and other wild life along with surround mountain views. Just like the song goes "nothing could be finer"! Wolf ski resort is just 15 minutes away. dishwasher tabs and dish soap are supplied along with paper towels, napkins etc..
2 dinning room tables seats 24 in dining room The kitchen table seats 8 We also have a card table and four chairs that can be added if needed. Wrap around deck with surround views of mountains and grounds. Visit Beautiful Biltmore Estate on a schedule that works for you with a ticket that offers two all day access to Biltmore House, gardens, Winery, River Bend Farm, shopping, dining and Antler Hill Village for less than the price of a one day ticket. Who doesn’t love a tailgate or farmers market of fresh veggies, meat and dairy products not to mention home made goodies and crafts of every kind. These markets are all nearby 10 to 20 minute drives of Norally Vacation Rentals. Looking for something to do? Norally House is near many great attractions, activities, and areas of interest. We provide brochures of all area activities and attractions. Cradle of Forestry If the natural beauty of the mountains is not enough to keep you busy with sightseeing, then check out all there is to do at The Cradle of Forestry. There are guided tours, restored historic buildings, exhibits, a gift shop and more. Kids will certainly enjoy seeing the restored locomotive and wandering the forest. Sandy Bottom Trail Rides For your horseback riding adventures is our guest favorite. River Rafting There are many rafting and tubing outfitters. We keep brochures at both rentals for guest to view. Great Swimming Holes- Along the South Toe River is The Carolina Hemlock . The mountain-cold water cascades from Mt. Mitchell, the highest peak in the Eastern U.S., and there are large slabs of rocks ideal for sunbathing. th. Green River, is another popular swimming hole. Tube rentals are also available nearby. SOUTH TOE RIVER, NC Though the river is relatively safe, it does feature some true rapids. Davidson River-Pisgah National Forest The Davidson can be more powerful than it looks. NATURAL WATERSLIDE Sliding Rock-is a rock that forms a mountain waterslide in the Pisgah National Forest on U.S. 276 near Asheville. The 60-foot, flat, sloping boulder is a perfect launching pad for thousands of visitors every year. Fueled by 11,000 gallons of water pumped down the rock each minute, Sliding Rock is a perfect place for chlorine-free fun. (While you’re in the area, check out Looking Glass Falls, also on U.S. 276. The 60-foot waterfall is stunning and the wading pool below is perfect for children.) Located along US 276, about 7.5 miles south of the Blue Ridge Parkway (or a little over seven miles north off of US 280 in Brevard). Grove Park Inn is just 10 minute drive from Norally House. You don’t have to stay at the Inn to enjoy the fine dining and the activities that are planned all year round. Spectacular Blue Ridge Parkway One of America’s most scenic drives. The Blue Ridge Parkway is a short 15 minute drive from Norally. Craggy Gardens is located at milepost 364. Visitors can hike, picnic and take in panoramic colorful views all year round. The Folk Art Center on mile post 382 is a most see for the whole family. Educational events are held year round along with daily craft demonstrations from March through December. Hand crafted items from southern Appalachian crafters are available for viewing and purchase. Grandfather Mountain One of the highest peak in the Blue Ridge Mountains and is a truly rustic and fun adventure that includes a swinging bridge that sways a mile above sea level. Be sure to bring your camera to capture your treasured experience. There are also natural habitats with bears, cougars, eagles and otters. Smith-McDowell house Open year-round and located in downtown Asheville, the Smith-McDowell house has a reputation for being the oldest brick residence in Asheville. This beautiful Victorian home, built around 1840, has been restored and awaits your visit. Western North Carolina Nature Center Kids can spend the day at this nature center learning and having fun! Mount Mitchell State Park An area preserved around the Black Mountain Range, the highest range East of the Rocky Mountains. This is a wonderful place to come hiking, exploring, horseback riding or just enjoying the outdoors. Vance Birthplace Zebulon Baird Vance was a Confederate military officer in the American Civil War, the 37th and 43rd Governor of North Carolina, and U.S. Senator. Born in Weaverville, North Carolina. The five-room log house was reconstructed around original chimneys and its outbuildings are furnished to evoke the period from 1795- 1840. This historical site and tour is 10 minutes away from Norally vacation rentals. Thomas Wolf Memorial Thomas Wolfe and his mother's boardinghouse in Asheville, North Carolina—now the Thomas Wolfe Memorial—has become one of literature's most famous landmarks. Named "Old Kentucky Home" by a previous owner, Wolfe immortalized the rambling Victorian structure as "Dixieland" in his epic autobiographical novel, Look Homeward, Angel. A classic of American literature, Look Homeward, Angel has never gone out of print since its 1929 publication, keeping interest in Wolfe alive and attracting visitors to the setting for this great novel. This interesting tour is only 15 minutes away from Norally.